New Zealand. What a schlep. There are 17 mistakes in this picture. Can you find them all ? 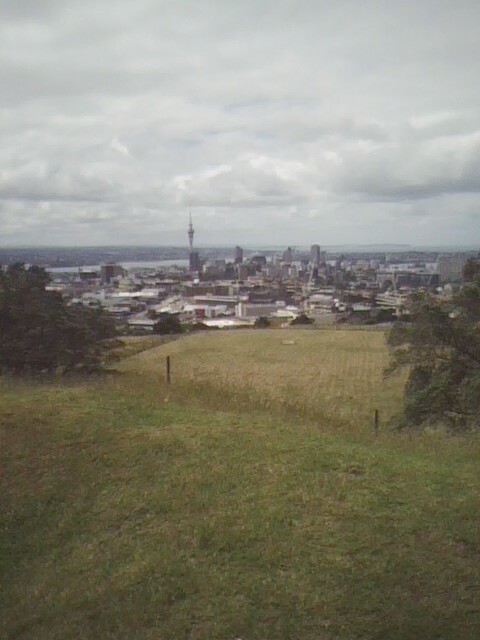 Auckland's downtown business district (actual size) as seen from the top of Mount Eden, one of the area's 49 extinct volcanoes. Dangerous? No. But that's just how I like to live. Hello friends, relatives, enemies and the indifferent. This is really just a test page. It will be revised as soon as I can figure out how to use this publishing tool. Hey – my sister-n-law wants to know if you are calling the season you are in right now “summer” or alternatively is your winter hot and your summer cold?? ?..eye roll, don’t blame me I didn’t ask it. She also wants to know if the kids get 2 months off for “summer” (like right now) like american kids. Whatevs….can’t wait to fly over on my way to australia. Did you get skype yet? Yeah I got Skype and you’d know that if you activated it once in a while. The season we are currently in right now is officially referred to as “the boozing time.” The children do indeed have several months off in which to drink booze. Then they go back to the factories in late February or early March where they spend as much as 12 hours a day knitting wool sweaters, or “jumpers” as they call them here, for export to Canada. I just realized my last comment might have come off a little terse. sorry, Jess.